What kind of internal wiring do I need? CAT5E or better wire is required. CAT5E is rated at one gigabit up to 300 feet and is perfectly acceptable. CAT6 and higer is rated at 10 gigabits and is more expensive, but would also work fine. CAT5 is only rated to 100MB, try to get CAT5E or you will be limited to a max of 100MB. What is the difference in the wire? The key tecnical difference in CAT3, CAT5, CAT5E, and CAT6 are the number of turns per inch in each twisted pair of wires. The more turns per inch the greater the resistence to "crosstalk" between wires. CAT3 (old telephone wire) is very loosely twisted while CAT5E has dramatically more twists per inch. I am running CAT5E to the outside of my house, what are the specifications? 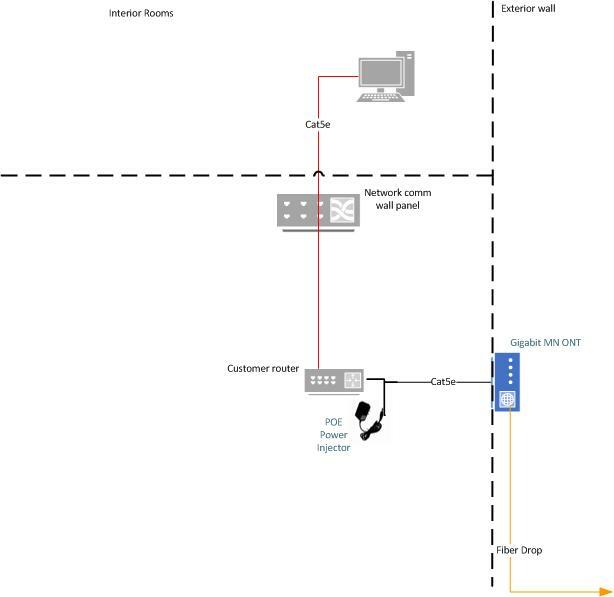 Our box (called a NID, Network Interface Device) is located on the outside wall of your home. Typically in the area where the electrical meter is located. The fiber comes up through a grey 3/4 inch sch40 pipe to the NID. The NID is mounted about 4-5 feet off the ground, level with the other boxes located there, or whatever works in unusual situations. The cable coming out of your house should be in this general area with plenty of slack (like 10 or 15 feet) to allow for connection. We will cut off the slack and place the RJ45 ends on the cable. The cable is usually zip tied to the pipe for strength and enters the NID through a rubber grommet. Almost always, the cable comes straight out of the siding in a 1/4 or 3/8 hole and caulking is used to make the hole water tight. In this picture the fiber NID is below the power meter and has a vent. 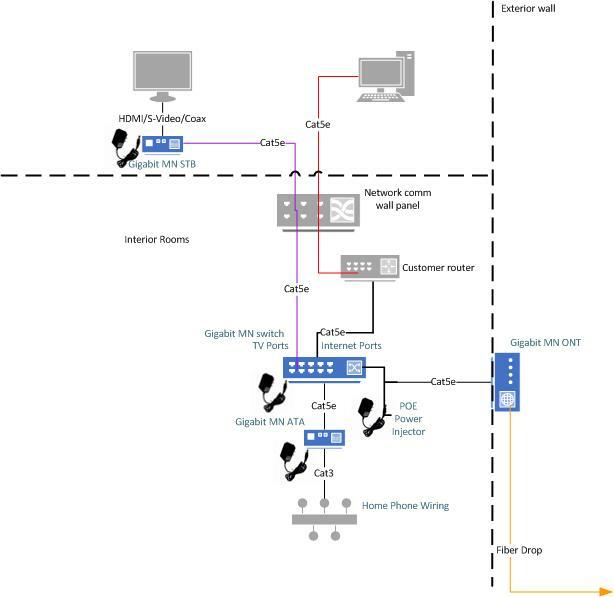 Which side of the house should I run the cable too? You should come out of the wall where the fiber is, or will be. We can email you a map of your house with the location. 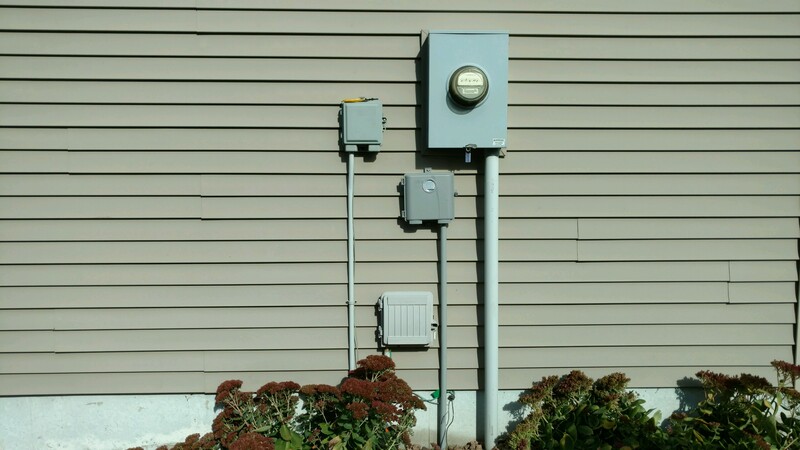 Generally, this is a side wall where the electrical meter is. There is Cat5E or CAT6 cable running to my existing telephone box. Can you use that? Yes. Most newer telephone cable installed is now CAT5E for use with either telephone or Internet. Do I need to put on cable ends (RJ45 connectors)? No. We will put RJ45 ends on the cables and plug them in during turn-up. I do not have Cat5E or CAT6 cable running to the room I need to add a TV or Internet, but there is an unused Coax cable. Will that work? Often it can be used. To use a coax cable, MOCA adapters are used at each end to convert the cable to gigabit ethernet. We have these devices available to rent. If you choose to do it yourself, please be sure you have the technical skills and spare parts to support them. Please do not call us. Where can I get CAT5E cable? Home Depot and Menards stock 500 foot box reels for $50 to $70. We don't recommend using any cable that has ends on it already. Often factory made cables are very difficult to add new connectors. Can I use flat cable? Preferably no. Specialty cable is for special situations, like running under carpet, and difficult to add connectors where they are needed.